This article offers a few tips on making your own wooden raising stakes instead of buying rather expensive metal ones. Aside from that it is so easy to make. When the Touchstone School of the Arts opened in western Pennsylvania in the early ’90s, the new craft school asked a number of teachers like myself to donate a workshop (no fee, just costs) to help them get started. That first year when the school had no tools or equipment, J. Robert Bruya taught a course on raising pewter vessels using rocks and sticks. His results were good, and I have always admired him for the audacity of it. And it speaks volumes about how one can use what celebrity chef Anthony Bourdain calls “System D,” which is the idea of using anything available to do the job. So when you’re raising vessels, if something looks like a raising stake, it is a raising stake. Being able to use what’s handy is especially beneficial when it comes to metal forming, as the metal stakes currently available can be very expensive. There are two main approaches to raising vessels. One is to use steel hammers and metal stakes, and the other approach is to use soft hammers (delrin, wood, nylon) on metal stakes, or metal hammers on soft (wood, delrin) stakes. As an alternative to the expensive metal stakes, wooden stakes can be made fairly easily and at low cost. To create a simple wooden stake, take a board (preferably hardwood) about 2 inches wide by 36 inches long and cut off each end at about a 45-degree angle; you can round the ends slightly for better metal shaping. 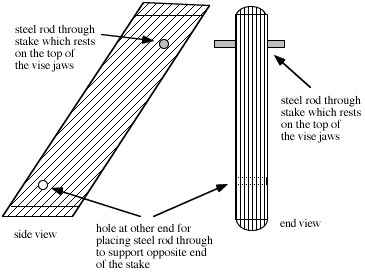 Then drill holes into the stake about a few inches from either end as shown in Figure 1. Insert a steel rod into the hole at one end; this will rest on the vise jaws and support the stake when it is clamped on an angle in a large vise. In Figure 2, I took this traditional stake design and created a smaller version that has a similar function but is better for storage purposes. The holes are drilled about 8 inches from either end. Each end of the stake can be carved into a different shape or angle, essentially creating two stakes in one. The same pattern is used for different thicknesses of wood to get different stakes to achieve a range of results. For example, the wider a stake is, the larger a vessel that can be raised on it. 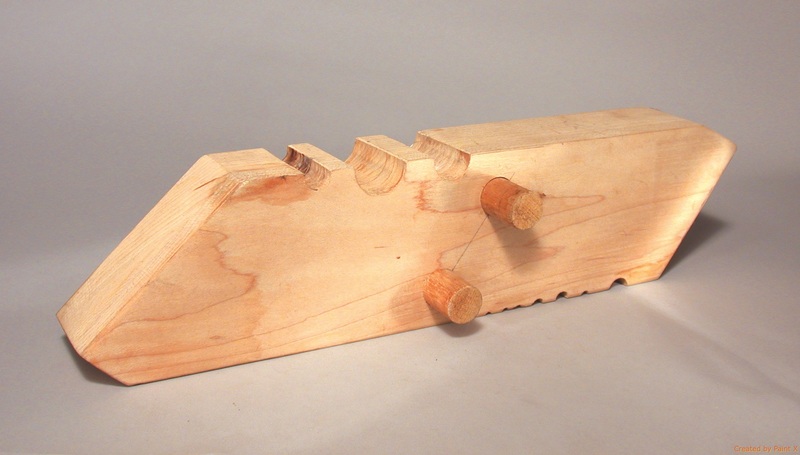 Also, while I prefer to use steel rods, which are strong and durable, you can also use wooden dowelling as the support. I’ve also made grooves on each side of the stake for bracelet tube forming. As shown in Figure 4, the visible end is still flat and needs to be rounded. A general rounding will suit most purposes but you can also change the degree of curvature for specific raising projects. These wooden stakes are cheap to make and very useful for raising and metal shaping. They store well and maximize function in a compact form. The inventor of foldforming, Charles Lewton-Brain is a Canadian author, researcher, and goldsmith. He lectures on his research into rapid manipulation of metal and its surface.